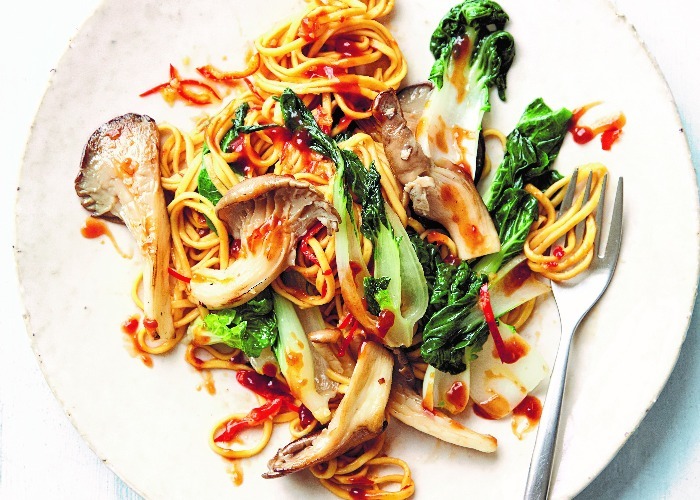 This Sichuan mushroom chow mein is a quick midweek supper that’s delicious, simple and packs a punch. Oyster mushrooms would be great but you can use whatever mushrooms you prefer. Whisk together all the ingredients for the Sichuan spicy sauce in a small jug or bowl, then set aside. Heat a wok over a high heat until smoking, then add the rapeseed oil. Add the garlic, ginger and chilli and stir-fry for a few seconds. Add the mushrooms and cook for 1 minute, then add the pak choy leaves and Shaohsing rice wine or dry sherry and toss for 1 minute. Add the spicy sauce and bring to the boil. Add the cooked egg noodles and toss together until they're coated with the sauce and warmed through. Serve immediately. This recipe is from Stir Crazy by Ching-He Huang. Published by Kyle Books. Photography by Tamin Jones.